Fleep status message is here! Sometimes, you want to let your team know what you’re up to without posting a message that would notify everyone in your team. For a while now, we’ve seen our users edit their names to “Jack Smith (working from home)” or “Kait (on vacation until 11.07.)”. Now, you can share such updates with the Fleep status message! We’re excited to share that the Fleep status message functionality is now available to all Fleep for Business users. If you’re on the free (Basic) subscription, you can try it out by starting a trial of Fleep for Business. If you don’t pick an emoji for your status message, and just type the message, then the Speech Balloon emoji will be used by default. You can always clear your status from the same popup, if you wish. Where is the Fleep status message shown? In 1:1 conversations, the status message is also shown in the conversation header, under the person’s name. Your own status is also always visible next to your name in the bottom left corner on the desktop version. The Fleep status message is now available on all desktop versions of Fleep, so you can set your status and see other users status messages on the desktop version. Mobile support is coming soon! 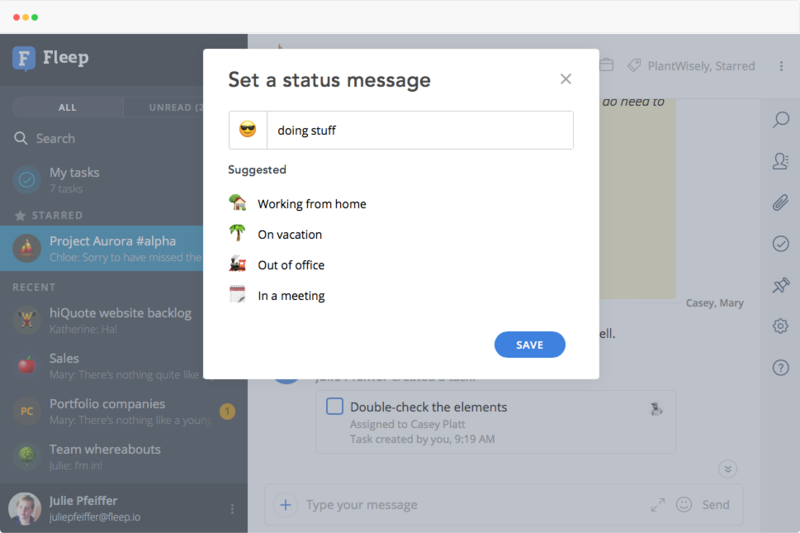 1. if you click on the emoji next to your name in the bottom left corner on the desktop version, it will launch the popup to set a new status message! This is a quick shortcut to changing your status. 2. type and send “/status” in any conversation — another quick way to launch the status message popup! We hope you enjoy using the Fleep status message features. Do let us know what you think via support@fleep.io. Let’s also stay in touch through our social media channels. We’re on Twitter, Facebook and LinkedIn. Ready to upgrade to Business? 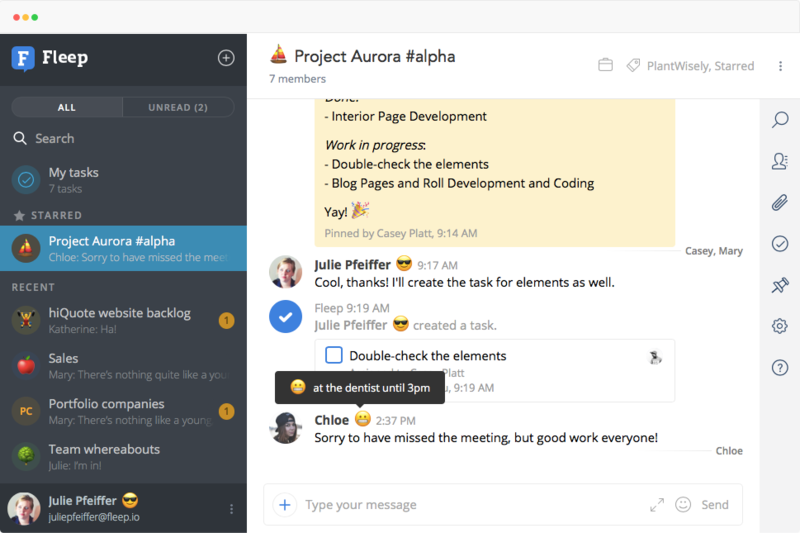 Start a free trial and get access to the status message feature, My tasks, admin controls and more!